In the studio creating a preparatory drawing for a new portrait commission. 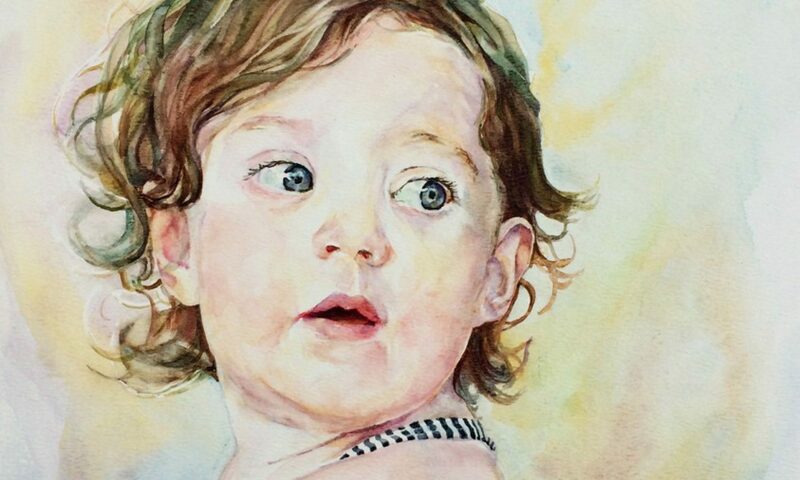 I am a painter specialising in light-filled watercolours. My painting practice began in Singapore twenty-two years ago. After my return to the UK in 2006, I opened a studio/gallery in the World Heritage City of Bath, England and now paint daily to commission and exhibition from my hillside studio nearby. I experiment and exploit the behaviours of flowing watercolour pigments in a technique I have called “gravity painting”. This subtle, cascading technique enables pigments to mingle and react within running water to create delicate veils of colour. I explain these techniques to art groups in workshops and demos, as well as in my own intensive one day Bath Watercolour Workshops and in articles for the Artist Magazine. I am particularly drawn to larger-than-life sized head and shoulder portraits where there is space for watercolours to flow and “sing”. By casting my subjects in strong lighting and controlling the way light falls. I love to work to commission to create intimate records of families and individuals. My paintings hang in private collections worldwide, including the Singapore Presidential Palace and have been gifted to HRH Prince Edward by the British High Commission in Singapore. I have exhibited with the Royal Watercolour Society and Royal Institute of Painters in Watercolour and I am an elected Associate Member of the Society of Women Artists, exhibiting annually at the Society’s summer exhibition.